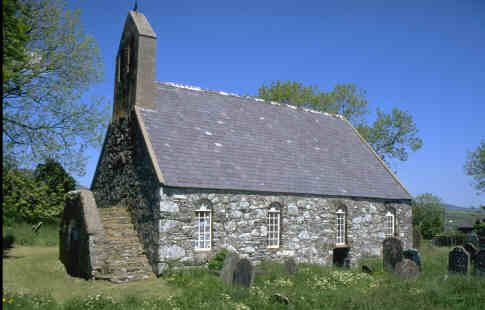 Until 1853 the parish church situated at approximately the centre of the Parish. Part of the original (probably pre-12th century) church can be seen in the eastern half of the existing church. The door was in the south wall, which though blocked inside can be traced on the outside wall. The church was extended westwards by about 5m in 1750-55; a record of 1798 states that the much earlier, moulded jamb-stones were removed from St Trinians. About the same time a western gallery was added (the stone steps are still visible) to house musicians (violins and flutes). The entrance is now blocked up. Like the doorway below the entrance to the gallery is flanked by massive masonry derived from an earlier site. When the new church was built the old church was used as a mortuary chapel; part of the east end was demolished and a door constructed.